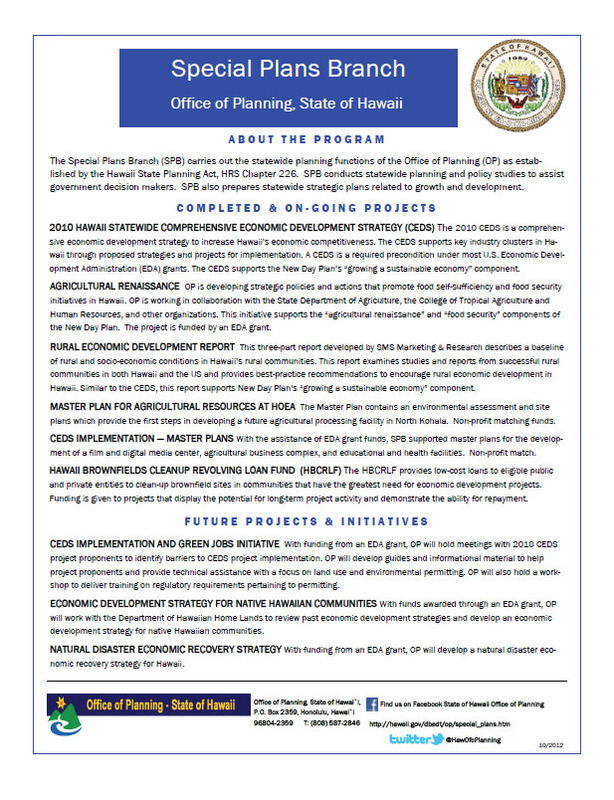 The State of Hawaii, Office of Planning, gathers, analyzes, and provides information to the Governor to assist in the overall analysis and formulation of state policies and strategies. The purpose of the Office is to (1) provide central direction and cohesion in the allocation of resources and effectuation of state activities and programs, and (2) effectively address current or emerging issues and opportunities. The Office works closely with local, state, and federal government agencies; the University of Hawaii; and various community stakeholders to achieve these objectives. The Office is divided into the Land Use Division and Planning Division. 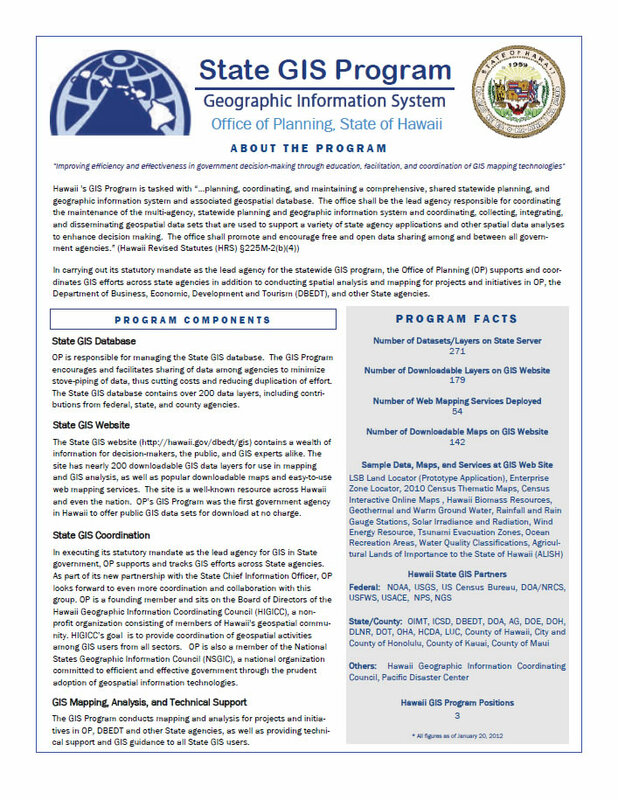 The Planning Division includes the Coastal Zone Management Program, Special Plans Branch, and the Geographic Information Systems (GIS) Program. 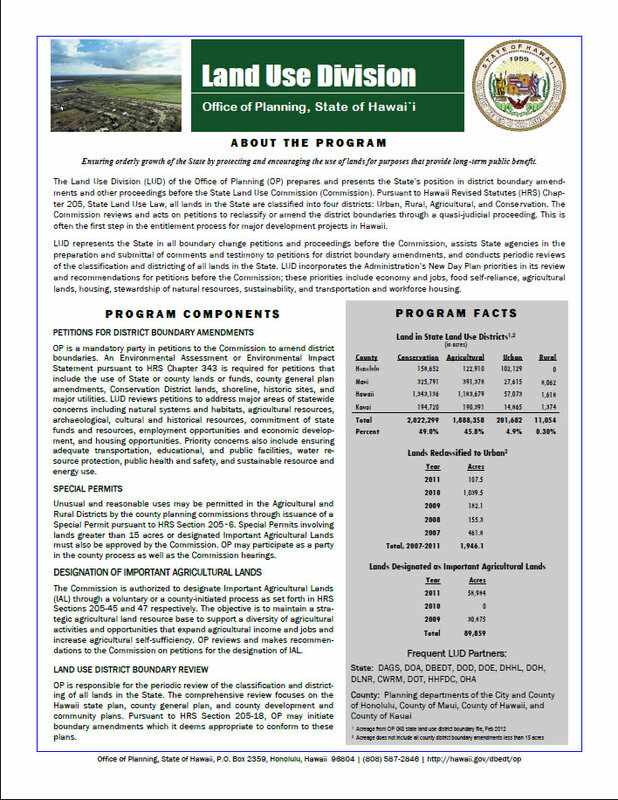 The Office is guided by two statewide planning documents (1) the Hawaii State Planning Act, which is a broad policy document that sets the table for all activities, programs, and decisions made by local and state agencies; and (2) Engineering Hawaii’s Future, which outlines the Administration’s priorities. 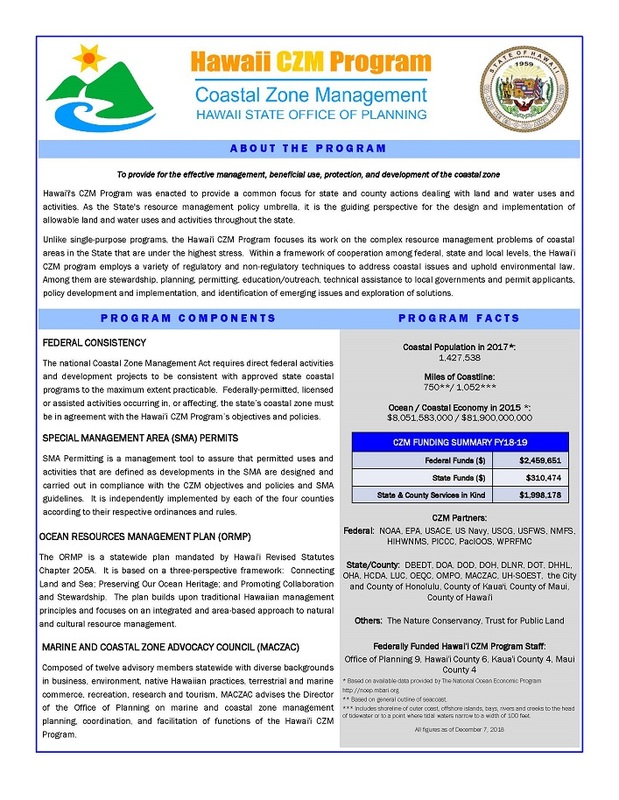 Current projects and initiatives are focused on implementing the Office’s mandates in relation to priorities that are laid out in Engineering Hawaii’s Future, including planning for the impacts of climate change (Adapting to Climate Change); ensuring the sustainable and economic use of our ocean and coastal resources through partnership development with all sectors, including the community (Hawaii Ocean Resources Management Plan) and leadership roles in the Pacific (Pacific Regional Ocean Partnership and Pacific Regional Planning Body); supporting better scientific and cultural knowledge to better manage our natural resources for current and future generations (National Estuarine Research Reserve System); decreasing Hawaii’s dependence on imported food (Food Self-Sufficiency Strategy); and coordinating the State’s participation in Transit-Oriented Development for uses such as affordable housing, educational facilities, and state services.